Welcome to the Grand View University Bookstore! shop for textbooks, supplies and official Grand View University apparel. 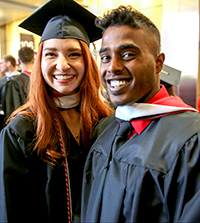 Commencement 2019 takes place on April 27th. Now is the time to order your Graduation Announcements. Don't forget to display your hard earned diploma in a beautiful frame. The Grand View Bookstore has teamed up with another vendor to provide low-cost and affordable textbooks! With this handy tool, you can see how our prices compare across the market all on one website without the hassle and stress of shopping elsewhere. Get Started Comparing Prices Today...You'll Be Glad You Did!